If you receive the challenging diagnosis of Parkinson's disease, the last thing you may want to do is start an exercise program. But doctors have known for years that doing so could be one of the best things for you. They just weren't sure why. Now, new research has shed some light on how the process works. Researchers at the University of Colorado Anschutz Medical Center have been doing groundbreaking work on Parkinson's for decades. In their latest study, published in PLOS One, they've finally been able to offer an explanation for the benefits of exercise. One of the major contributors to Parkinson's is the accumulation of alpha-synuclein, a neuronal protein, in the brain. By putting running wheels in the cages of mice as the mice approached mid-life, the researchers were able to determine that exercise helps stop the accumulation of this protein. After three months, the mice had better muscle control and cognitive function than mice that weren't given wheels to run on. The researchers also found that running on the treadmills increased expression of a protective gene called DJ-1 in the mice's brains and muscles. It's rare but possible for humans to be born with a mutated DJ-1 gene. When this happens, the person always develops Parkinson's and typically does so very young. This research helped explain the connection between DJ-1 and Parkinson's further by illuminating its ability to minimize alpha-synuclein accumulation. The researchers are confident that humans with Parkinson's who exercise will experience similar protective benefits. I agree, and I think this is an important reminder of the benefits of exercise for everyone, regardless of whether you have a Parkinson's diagnosis or not. 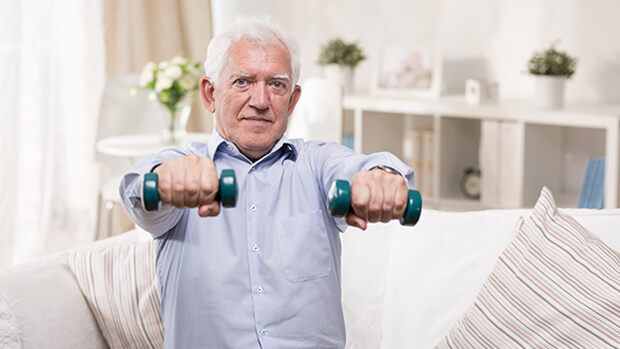 If you have Parkinson's or have been living a sedentary lifestyle for a while, talk to your doctor about the most appropriate way for you to begin adding exercise into your routine. You can check the archives for some of the programs I recommend. As you begin to exercise, I also recommend taking Perfect Amino. It will help support your muscles, an important factor in fighting both Parkinson's and age-related frailty, as well as give you additional strength to continue intensifying your exercise regimen.